Exciting day on the homestead! This morning we got a call from the Burr Post Office. 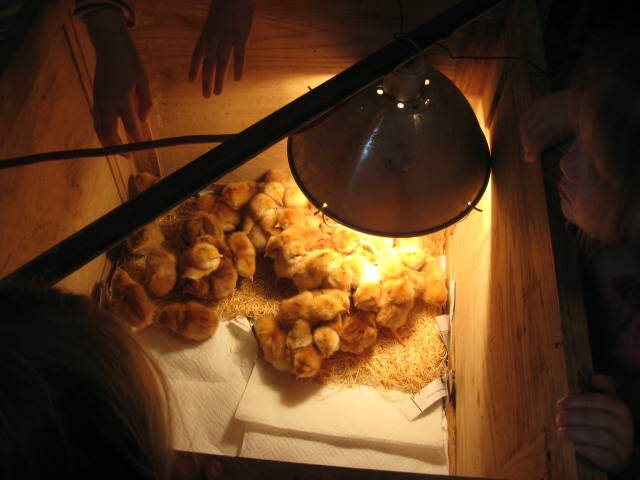 Our chicks were finally here! 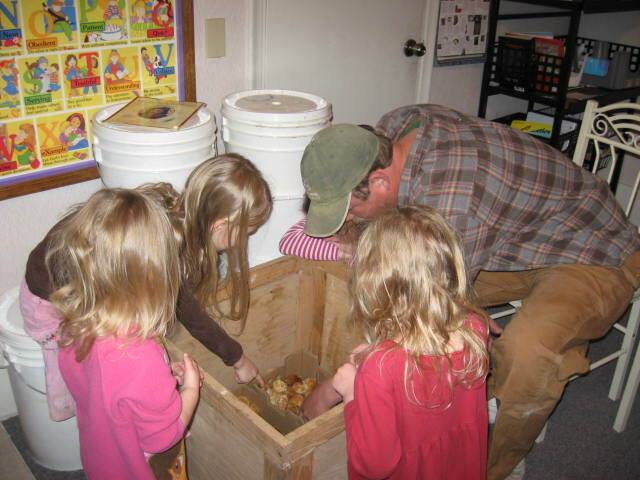 The girls finished their chores in record time and waited anxiously for our Beloved to bring them home. They’re here! The first animals for our farm! 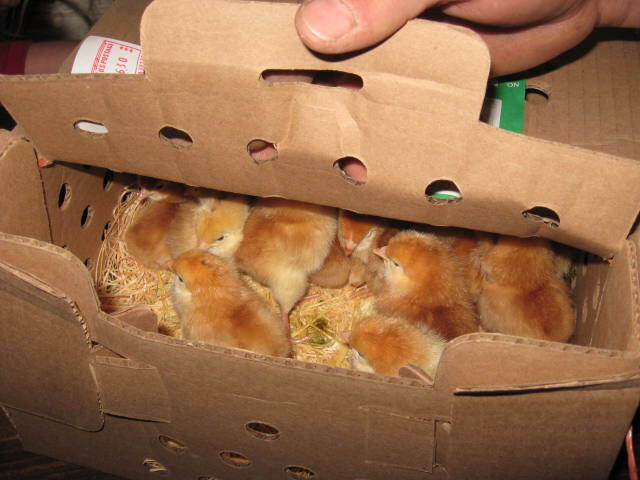 We thought it was just great that you could mail chicks in a box. Oh, are they ever cute! So, where are we going to keep them? Maybe in the den for a little while. Have to get the warming light set up. Sweet little fuzz balls. I’m glad they are for eggs, not for meat. Allows you to attach yourself a little. The girls have already named a few. I think I’ve heard the names Buttercup, Sarah, Felicity, and Filemina (Ashlynne is very non-traditional in the name department). I’ve already forgotten what the house sounded like without 50 peepers. They might quieten down if the girls would leave them be. Maybe they won’t be so fascinating after a few days. The next big event is at lunch. 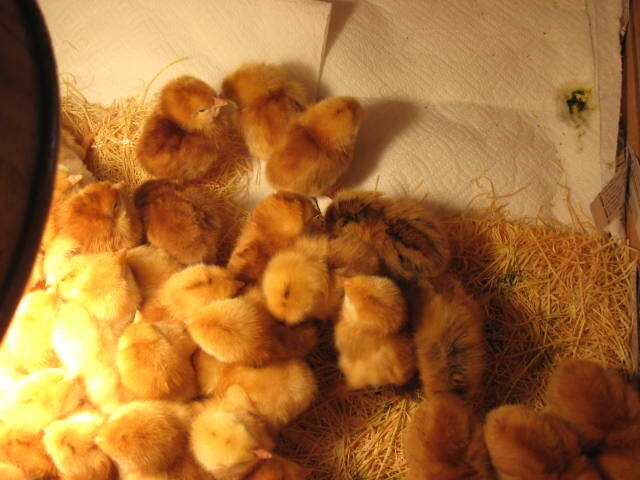 Beloved is bringing home chicken feed from the Co-op and we get to see these babies in action. 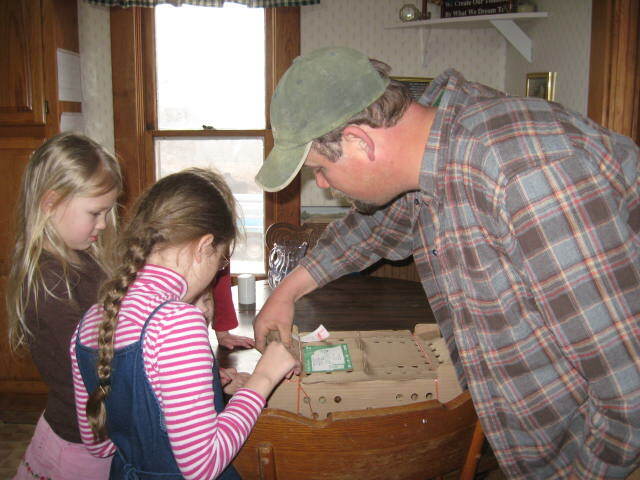 I’m dreaming of fresh, brown eggs already. I’ll probably be dreaming until August or September. I’m loving your blog! I would love to correspond with you via email if you’re up to it. Your life sounds as full and pleasantly busy as mine, so it would of course be a low-pressure, “get back to me when you can” type of correspondence… =) I want to know how you ended up subscribed to the King’s Daughters magazine, pick your brain about moving across country, about debt and off-grid living… My husband and I are headed in the same direction for, judging by what I’ve read here so far, pretty much the same reasons, and we have much to pray about right now. It’s not easy being radical, is it? Ha.